- Benito and Jim argue over Rick's behaviour. - Matthew Forrest turns Debbie down for a job on the basis that she's too plain looking. - Debbie sobs to herself about how ugly she is. Jim and Helen are having a quiet evening in. Jim looks out of the window and spots that the lights are off in the Alessi house, but their garage light is on, even though the garage door is closed. Helen thinks they may have left it on for security reasons, but Jim worries that someone may have broken in. Philip makes his way through the seating area, asking patrons if they're enjoying their night. He approaches Doug and suggests that he move him into a larger room, but Doug declines - there's only him in the room! Doug thinks that hotel living and the single life is lousy, and Philip gives him a matey punch on the arm. Lou arrives in time to hear the end of the discussion. Philip leaves and Lou sits with Doug. Lou doesn't want Doug to be down in the dumps, but Doug is incredulous - Lou was the one nursing a broken heart a few weeks ago! Lou says he still is, but Dorothy reminded him of positive thinking. Lou admits he went overboard with the positive attitude before, but it does have its benefits - tomorrow is the first day of the rest of his life! LOU: Look, I was getting suicidal over what happened with Madge. You know how much I fell for that lady. BUT, that was yesterday. Today is today! And when you're single, the whole world is your oyster! There's plenty of pearls to be won in the sea, me hearty. Ha ha ha ha! Lou spots some women on the other side of the bar, but Doug isn't interested. Lou tells him that they can't sit around moping when there's beautiful women begging for their attention(!) He gets up to approach the women. LOU: Don't worry, old son. I'll show you how it's done. 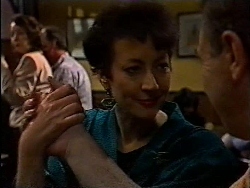 Lou approaches a woman and starts trying to charm her. Doug laughs as he watches on. The woman - Sue-Ellen - recognises his names from his car yard adverts on the television, and wonders what's happened to him being a family man. Lou tells her that things change, and invites her to sit with him and Doug, which she accepts. Rick is whinging about how he won't be able to sleep in the car. Benito tells him not to complain as he's got the whole back seat to himself, whereas he's got a steering wheel stuck in his stomach! Cathy suggests that Rick move into the front and she and Benito take the back seat. Rick is not at all impressed by the idea of ending up with the steering wheel! RICK: Is it too logical to ask someone for help?! BENITO: I'm not going to go to the Martins or the Robinsons - they'll think I'm a complete fool! CATHY: A night in the car won't hurt us. (They are completely insane.) Rick moans that it's too early to sleep anyway, and asks if they can go out somewhere instead - but Benito reminds him that he doesn't have any money. Rick suggests that they go for a drive - he feels like a real gumboot sitting in the garage! Benito agrees, just as Jim starts banging on the garage door and yelling their names. Rick is pleased, thinking that Jim can help but Benito orders him to hush. Benito gets out of the car just as Jim opens the garage door. Benito explains that they were about to go for a ride, and Jim mentions that he saw the light was on and feared that the thieves had returned. Just as Jim's about to leave, Rick bursts out of the car and exclaims that they're locked out! Benito looks abashed as Rick explains how they're locked out of the house and they can't get in due to the alarm so they were going to spend the night in the car. Jim thinks it's ridiculous, and Benito defensively points out that it could happen to anyone! Jim clarifies that he thought it was ridiculous that they should sleep in the car. JIM: Well, you'll have to spend the night at our place. BENITO: That won't be necessary. RICK: (hurriedly) That'd be great, Mr Robinson! Reluctantly, Benito follows Jim out of the garage! Toby is waiting up to speak to Dorothy. He tells her that Joe rang about the school up near where Joe and Mel live, and despite all of the previous wrangles with trying to get it open, it will definitely be open for the start of next term - and Joe's put Toby's name down. 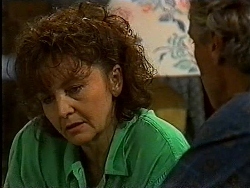 Dorothy looks a little taken aback, but hides her dismay as Toby's so enthused about being able to live with Joe and Mel. Toby doesn't say anything, but seems to realise that she's upset. Gaby and Debbie are piling make up back into a bag. Debbie says she has to rush home, else Julie'll be on the warpath. Gaby tells Debbie that by the time she's finished with her, Matthew Forrest will be begging her to take his job - he won't be thinking her plain and ordinary the next time he sees her! Debbie thanks her and leaves. Pam says that watching Gaby and Debbie made her feel really old; she's been losing her enthusiasm for life of late. Gaby doesn't think it's surprising, given what she's been through. Pam talks about looking for a whole new start but Gaby queries if that's what she really wants. Gaby mentions that Doug will pop by to pick up some of his tools tomorrow. Pam asks if she knows what time, so she can make sure that she'll be out! Lou and Sue-Ellen are having a good laugh, and Doug makes his excuses to leave. 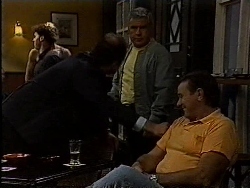 They convince him to stay and Lou offers to get the drinks in. In the background, a woman sitting at the bar is having a good ogle at the group. SUE-ELLEN: I'd like a pink gin this time. LOU: A pink gin? Do you know how hard it is for me to get up to that bar and ask for a pink gin? But Sue-Ellen, for you, anything! Sue-Ellen tells Doug that she's always liked brooding men. Doug tells her that he's not usually brooding; he's just feeling a bit down. He explains that he recently split from his wife, and Sue-Ellen tells him that she understands how he feels but he has to put it behind him. Doug says he hasn't got to that stage yet. Sue-Ellen grabs his hand and suggests that he needs someone to talk to - she's been there herself, so she knows how bad it can get. Lou comes back and asks what he's been missing out on! He hands Sue-Ellen her pink gin, but she says that she's decided to call it a night. She hands Doug her phone number in case he changes his mind. Lou looks surprised and asks what he's supposed to do with the pink gin! She apologises and leaves. LOU: What the hell did you say to her?! DOUG: I just told her I wasn't interested. Lou thinks that he must be losing his touch - the minute he turned his back, she was all over Doug! Doug gives him the phone number as he won't be using it, but Lou reckons that he has got some pride left! Cathy and Helen are tidying up the kitchen. Benito wanders in wearing a pair of Jim's pyjamas which are miles too big for him and asks if Cathy's coming to bed. Jim can't help but laugh loudly at the sight of him! Cathy thanks Jim again for letting them stay. JIM: It's ironic, really. Rick will end up sleeping in Debbie's bed. Benito keeps going on about how he needs an early night and an early start. Helen offers for them all to have breakfast in the morning, but Benito isn't keen and is quite rude in his response. As Cathy and Benito retire, they bicker all of the way to the bedroom about his attitude! JIM: Not exactly gracious, is he? Helen thinks that it's time the stupid rift was healed, but Jim points out that Benito isn't very willing! Debbie calls to make an appointment with Matthew Forrest. She lands one, so she and Gaby start having a makeover. There's a rock montage of Gaby putting Debbie's make up and doing her hair. Pam comes out of the bedroom and gushes about how Debbie looks. Debbie can't believe that it's her. Debbie worries about making a fool of herself, but Pam reassures her that Gaby's right - she'll knock Matthew Forrest dead. Benito, Cathy, Jim and Helen are having an uncomfortable breakfast. The Alessis have found a locksmith and Benito keeps wanting to go and wait for him, despite Helen's protests. Jim stands too, just as Philip appears through the back door. Jim disappears to leave them all to it. BENITO: I don't think we have anything to say to each other. HELEN: I don't agree. I think it's time we put a stop to all this ill feeling! CATHY: Hear hear! It's no good being enemies with your neighbours. Helen remarks that she's already apologised to Cathy for her part in the proceedings. Helen apologises to Benito and Philip chimes in, saying he wishes to apologise as well because what they did was pretty irresponsible. Benito carries on ranting, and comments that they even lied to Julie. 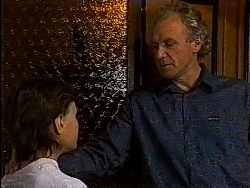 Philip and Helen point out that they've spoken to Julie and she's forgiven them, so they hope that he can too. Benito appears reluctant, so Philip tries again with another heartfelt plea, explaining that he and Helen thought it was a once in a lifetime opportunity for the kids. Cathy accepts this, as long as Philip can understand the reasons why they were upset - which he appreciates. 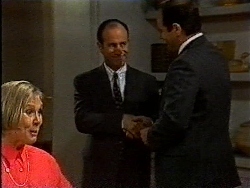 Cathy urges Benito to agree, and Philip and Benito shake hands. CATHY: Rick'll be pleased. He's really missing Debbie. BENITO: That ban stays. They're a terrible influence on each other. HELEN: They're not allowed to go out together?! BENITO: I don't want them to even *see* each other. PHILIP: Well, I think that's pretty rough. I know Julie will agree with you. BENITO: So, that's the way it's going to be. Ok? Debbie is twirling around for Matthew like she did yesterday. He tells her that she looks familiar, and she tells him that she's done a lot of modelling, so he's probably seen her in a magazine. Matthew reckons that a girl like her would stick in anyone's mind, and if she works for him, she'll go a long way. Matthew sleazes over her and offers her the job. Debbie takes off her sunglasses and reveals that her name is Debbie, and she came for the job yesterday but he told her that she was plain and treated her like dirt. Matthew is absolutely gobsmacked. Debbie rants and raves at him over him treating women awfully unless they look like a centrefold, and reveals that she only wanted him to offer her the job so she could tell him what to do with it! DEBBIE: I wouldn't work for you if you begged me! You're nothing but a worm! A plain, ordinary, unintelligent, disgusting little worm! DEBBIE: I just did! And you know what? I feel great! Jim answers the door to Toby. Toby wonders if Jim wants his lawns cutting but Jim tells him that at the prices Toby charges, he'll do them himself! Toby tells Jim that Dorothy got her divorce papers. Jim thinks that Toby shouldn't be spreading Dorothy's business around! Toby pointedly says that he thought Jim would like to know, as the pair of them are really good friends and she hasn't got anyone and neither has he! Jim is amused at Toby's efforts to matchmake but tells him that they're dear friends, and that's it. Toby asks if Jim's interested in someone else. JIM: Get out of here! 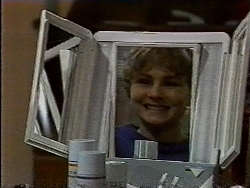 He smiles and shuts the door on Toby, and looks thoughtful to himself. We zoom in on a picture of Doug, Pam, Gaby and Brad (oh so subtle!) and Pam is sitting on the sofa, looking sad. She's going through a photo album and crying. There's a loud knock at the door - it's Jim. He admits to having stayed away, but doesn't think that they have anything to feel guilty about. Pam points out that they both know there was more to it than just enjoying each other's company. Jim says that nothing happened between them but Pam tells him that the way she felt for Jim was almost as bad as what did happen between Doug and Jill. PAM: I thought I was in love with you, Jim. And I know that Jill didn't meant anything to Doug. So I'm not sure which of us is more at fault - me or Doug? JIM: How do you feel now? PAM: Confused. I still feel a lot for you, Jim. But I don't know that we could have any sort of a future together. I'd always have Doug on my conscience. And... ...I do love him. I suppose it's possible to love two people at once. But you can only make a life with one of them. ...and Doug and I have a lot of history behind us. Jim says that it sounds like she wants to make it up with Doug. Pam tells him that she's realised she'd be a hypocrite if she didn't make it up with him - after all, she and Jim came near enough. Jim says that it's good that they might end up back together again - she and Doug had a happy marriage for a long time. Pam agrees and says that it has to count for something. They still don't both look very happy though! Debbie is walking through the complex and bumps into Gaby. Debbie raves at how her meeting with Matthew went, and tells Gaby about how Matthew came onto her and how she just cut him dead. Gaby has to rush off to the bank and Debbie thanks her for everything. Debbie walks across the bridge and Rick spies her on the other side. He hurriedly puts down some milkshakes for a table and approaches her. They discuss whether they're safe to meet up, and they duck off to talk. Debbie thinks it's rotten that they're not allowed to see each other. DEBBIE: What do you mean? RICK: Do you have to ask?! With the way you look?! I wasn't even sure it was you for a sec. DEBBIE: Oh. You mean because I look ok for once? RICK: (upset) Ah, no no, of course not. RICK: I didn't mean that at all. He talks about lying low for a while so their parents think that they're going along with the ban. Debbie thinks it's all unfair but Rick reckons that if the olds think it's over between them, they might back off a bit. They start to pash, and are sprung by Benito! Benito bawls him out for not only breaking the ban, but for skipping work at the car yard where he should be. He sends him off. Rick tells him that they've decided to do what they want - they aren't going to see each other again. Benito tells him that he'll make sure they don't! (Benito looks most surprised at Debbie's attire in this scene and his reaction is brilliant!) Debbie sighs! Debbie has told Philip that she and Rick aren't going to see each other. He pulls her down to sit with him on the sofa and tells her not to break things off with Rick completely - in time, everything will cool down. Debbie says that it's probably best they move on anyway. Philip wonders if this change of attitude has anything to do with her change of image! Debbie protests and leaves. Philip calls her back and tells her that although she looks lovely, he liked her the way she was originally. Lou is lifting weights(!) Toby is worried that Dorothy will be really lonely without him. He says that she's been so good to him, so he feels rotten leaving her on her own. 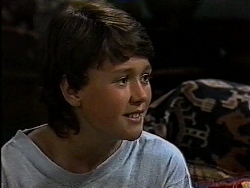 Lou reminds him that he *should* be with his Dad and Mel - being in Ramsay Street was only a temporary measure. Lou tells him to feel his bicep and guess how old he looks! Toby squeezes his bicep. TOBY: Oh, I don't know. All old people look pretty much the same to me. Lou is most put out! Doug calls around. He thinks that he and Pam should chat. Doug tells her that he's been missing her like crazy. Pam is short with him, and reckons that he's enjoying his freedom too much to be thinking about her. Doug insists it's not true - he's not so much as looked at another woman; Pam's the only woman for him. Doug tells her that they'd be making a stupid mistake if they threw their marriage away. PAM: Words are cheap, aren't they? DOUG: What are you on about? PAM: I just had a call from a former patient and she said she saw you at the Waterhole last night with a woman draped all over you! DOUG: That must have been Sue-Ellen. PAM: Ohhh, oh, really? Sue-Ellen. One of the women you've never looked at?! PAM: Oh, don't 'oh hun' me, Doug! Pam flips and chucks him out, saying that she never wants to see him ever again!